The debate over when The Simpsons “got bad” is not one that’s particularly interesting to take part in. The popular consensus is that the ninth season was the show’s last “good” season, but even after that there were plenty of peaks to compliment the more notorious valleys. A debate I find far more compelling is: when did The Simpsons get good? Or, more accurately, when did The Simpsons come into its own? It was a show that had only minor growing pains, and despite quick improvements in animation and some more solidified vocal performances over the course of the first season, emerged mostly fully formed. But it took a little bit to become complete. Which is why I’d like to present a case that, conveniently, ties into this week’s holiday. What a coincidence! “Bart vs. Thanksgiving”—the seventh episode of the show’s second season—was conceived when the show’s writers realized they would have an episode airing precisely on Thanksgiving Day, 1990. It was the first episode to be helmed by writer George Meyer, a man whose influential virtues we’ve already extolled here, and who is generally credited with perfecting the show’s comedic voice. That voice is on full display here, especially his contributions to the show’s takes on empty patriotism (“The Western Hemisphere! The dancin’-est hemisphere of all!”) and the meta-humor that would become one of its defining features (“If you made a balloon for every flash-in-the-pan cartoon character, you’d turn the parade into a farce!” says Homer, in reference to the Macy’s Day Parade, right as a balloon of Bart passes behind them on the TV). 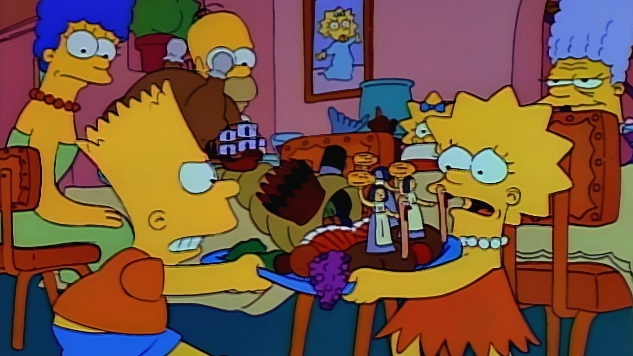 The episode centers around Lisa’s Thanksgiving diorama, which Bart accidentally destroys in the midst of a petty sibling argument. Refusing to apologize to the devastated Lisa, Bart opts to run away from home, taking him on an odyssey to the wrong side of the tracks before finally realizing his mistake and returning to apologize to his sister. It’s an episode that exists most significantly in conversation with the show’s pilot, “Simpsons Roasting on an Open Fire,” which introduced the show as not only comedically daring, but also uniquely attuned to working class anxieties. In that light, “Bart vs. Thanksgiving” re-engages more aggressively with the themes that defined the best years of The Simpsons. Thanksgiving is a more fundamentally passive-aggressive holiday than Christmas, and in this episode, tensions between Marge, Patty and Selma allow the show to more directly engage with the joys and disappointments that come with opting into a family unit. “I have laryngitis, and it hurts to talk,” says Marge’s mother. “So I’ll just say one thing: you never do anything right.” Enough has been said about the Peter Griffin-ication in how The Simpsons’ treatment of Homer’s relationship with his family has evolved. But “Bart vs. Thanksgiving” nails the central thing about Homer that the culture war outrage over The Simpsons completely missed: he desperately, desperately wishes he was a better father, and is consistently disappointed in himself as a result. “Oh Lord, be honest,” he says during grace. “Are we the most pathetic family in the universe or what?” “Amen” says the rest of the family. Homer and Marge had been satisfactorily cemented in the Season One episode “Life on the Fast Lane,” which won the show an Emmy in its depiction of Marge on the brink of an extramarital affair due to Homer’s inconsiderate habits. It’s an episode of big, messy emotions. The conflict between Bart and Lisa is comparatively simple here. But in focusing on the early rivalries between siblings who can’t believe they’re in the same family, and, more importantly, the ways those rivalries often lead to their first experiences with regret, “Bart vs. Thanksgiving” critically establishes the underlying love and protectiveness they feel towards each other, and our understanding of the Simpsons family is complete. The writers would be able to complicate that understanding many, many times over, but they could only do that once all four of them had a seat at the table.